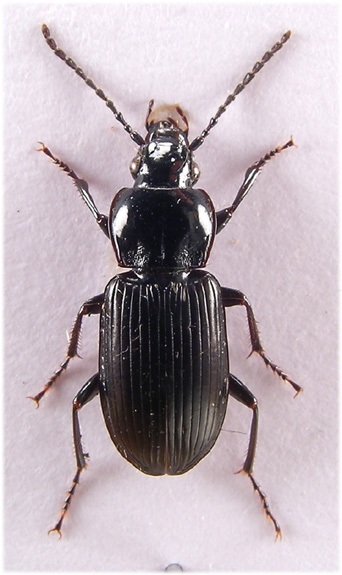 Female The discovery that the sibling species Pterostichus rheaticus Heer (Luff, 1990) occurs in the UK and had previously been recorded as P.nigrita rendered the known detailed distribution of these species unreliable. Both species, however, are considered widespread in the British Isles. They are often found together but P.rheaticus prefers more open habitats e.g. grassland and meadows while P.nigrita is found in damper habitats, river margins, moorland, damp woodland etc. 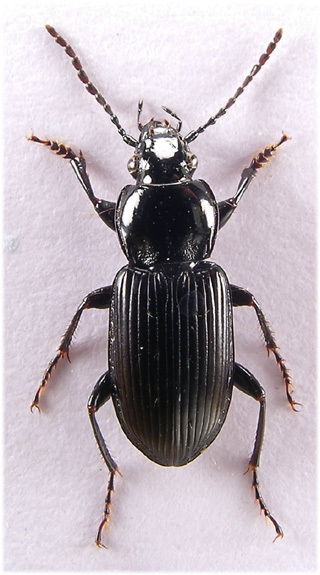 P.nigrita is common throughout the Watford area being conspicuous in the spring when turning logs in woodland and parkland will almost always find them. During the early summer they are active nocturnally on parkland pathways and turn up frequently in town centre pitfall traps. Adults are seldom found in the winter, in our experience only from Whippendell wood (late December). Thought to be a spring breeder. 8.8-12.8mm (Lindroth) Two setiferous punctures besides eyes. Antennae pubescent from third segment, basal segments not keeled (cf. 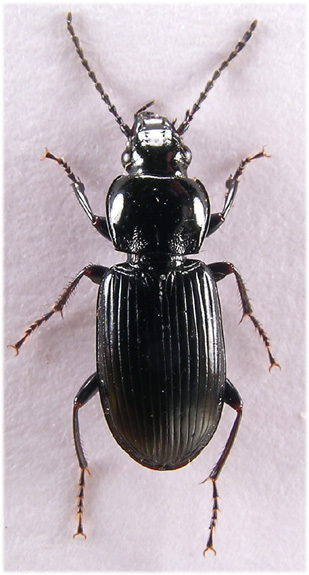 Poecilus). Mandibles sharp, symmetrical. Pronotal shape characteristic; smoothly rounded in front of distinctly toothed hind angles. Basal fovea doubled, innermost not extending onto disc (cf.P.niger). Elytra glabrous with reticulate microsculpture, usually with three dorsal punctures, the posterior well removed from apex. Epipleurs crossed. Each elytron with 8 striae across middle and well developed shoulder and scutellar striae. Legs black, base of tibiae sometimes dark red. Terminal segment of all tarsi glabrous beneath (P.melanarius), basal segments of pronotum dilated in male. With a little experience this species is obvious by its size and pronotal shape; smoothly rounded in front of distinctly toothed hind angles. 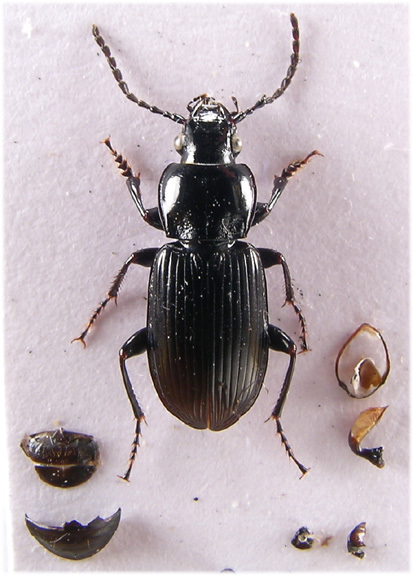 With the discovery of P.rheaticus, however, specimens need to be dissected in order to achieve a certain ID. Luff, 1990. 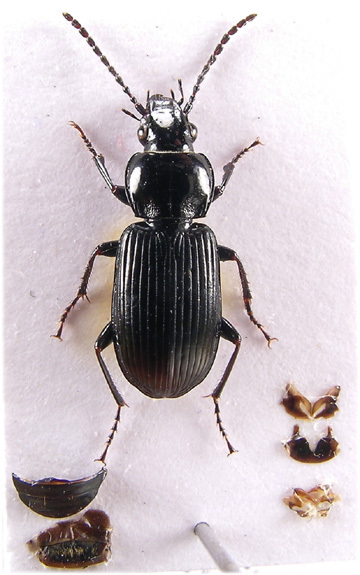 P.rheaticus Heer, a British species previously confused with P.nigrita (Pk.) Ent. Mon. Mag. 126:245-249.